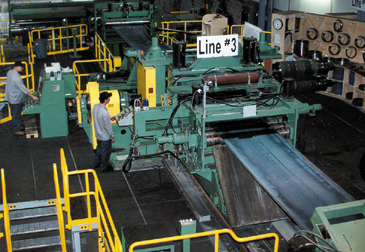 Brookfield, OH - United Steel Service, Inc., (Uniserv) a large steel distributor and coil processor headquartered in Brookfield, OH, has completed the installation and commissioning of a heavy gauge coil slitting line, Uniserv's second large slitting line installation in 2 years. Both those slitting lines were designed and manufactured by Braner/Loopco, Schiller Park, IL. Uniserv's newest slitting line is slated to service the heavy gauge high strength hot rolled black and pickled carbon steel as well as the heavy gauge stainless coil markets. The line is capable of processing 55,000 lb. x 60" wide high strength carbon and stainless coils in gauges from .060" through 3/8". 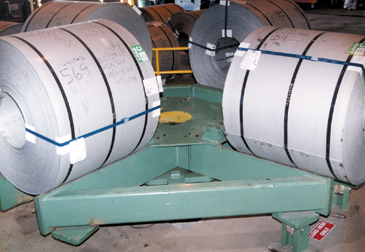 Entry Coil Staging: Coils are pulled from inventory and loaded onto a unique 4-coil turntable at the entry end of the slitting line. The coil storage turntable supports master coils from the OD rather than the ID as is common with coil storage "turnstiles". Because the coil and hook are not threaded over an arm, crane loading coils onto the turntable is considerably faster and more efficient than loading coils onto a turnstile arm. In addition, coil damage from bumping into turnstile arms during loading is eliminated. The line is equipped with an entry coil straightener to flatten coil-set and cross bow during threading and running, a Gamma non-contact thickness gauge, an entry shear for cropping coil head ends, a "Turret Head" slitter with two quick-change slitter heads, a tension stand to produce uniformly tight-straight sided coils, and a double end "turret" recoiler that allows OD banding off-line.